COMING SOON- We have had so many requests from our Military, Law Enforcement, and Survival friends for a dependable hard working blades and sheaths that we have decided to produce our version of the best working knife you can buy. They are currently being tested and evaluated by several wings of our military special forces. Once the final version is available we expect a tremendous response. Supplies will be limited. If you want to get on the pre-order list please call today. As of 1/14/2014 Chisholm’s Trail has officially started a new Tactical Knife Division with business notification. This ASL Knife system © is official and trademark has been applied for. Knife designs and accessories are copyrighted and can not be replicated in any way, shape, or fashion. We have spent a tremendous amount of time working with representatives in the Special Forces community. Warriors such as Air Force Commandos, Army Green Berets, Navy Seals, and Marine Recon & Raiders are working with us on developing this blade. Some of the topics of input were type of steel, thickness, weight, length, color, and sheaths to mention a few. This first offering is the result of our veteran’s input and advice. We are not representing our selves as “Custom Knife-makers,” but we are smart enough to consult those that are. We are getting our blades with our designs hand made in the USA only by a professional knife company. They are not pre-made blanks available to anyone. We are obtaining the best “grippy” handle material we can in suggested colors, closely fit to the handle metal. 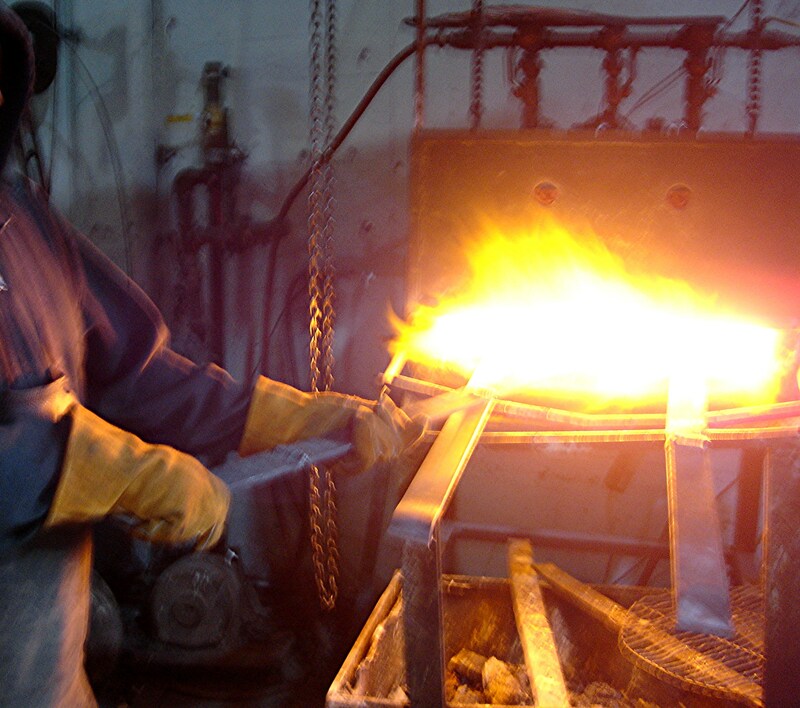 Each blade is hand ground and carefully heat treated to around RC 57. Our Kydex sheaths will be made by the best maker available and the leather sheaths will be hand made by us. Our knives will perform what they will have been tested to do- period. We don’t produce by the hundreds but by a dozen at a time with intense inspection prior to shipping. Supply will be limited. (Production Pending) This first survival sized knife will have a blade approximately 4 7/8″″ long, 3/16″ thick, and 1 1/2″ wide. There will be no reflective surfaces. The handle will provide good grasp and will be impervious to water. There will be a good blend between hardness and flexibility with a Rockwell of around 57. An all around edge grind and ease of resharpening has been provided. This is the perfect knife for any special forces member, tactical team, or survivalist to add to their dependable gear. As a result of this research and testing, our ASL- 5S will also be the ultimate survival and bug out blade. Sheaths will be made in Kydex or leather and there is e a separate cost. Call to pre-order and get on the list now. We expect tremendous response to this first knife and will see you in June at the Atlanta Blade Show. Significant discount will be provided to current active special forces members. 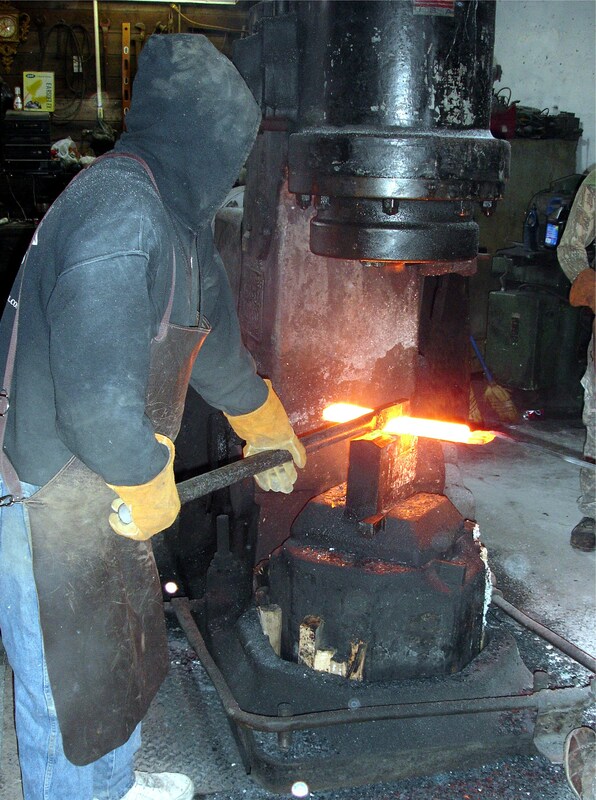 When we went in we found the steel being heated to a red hot temperature. 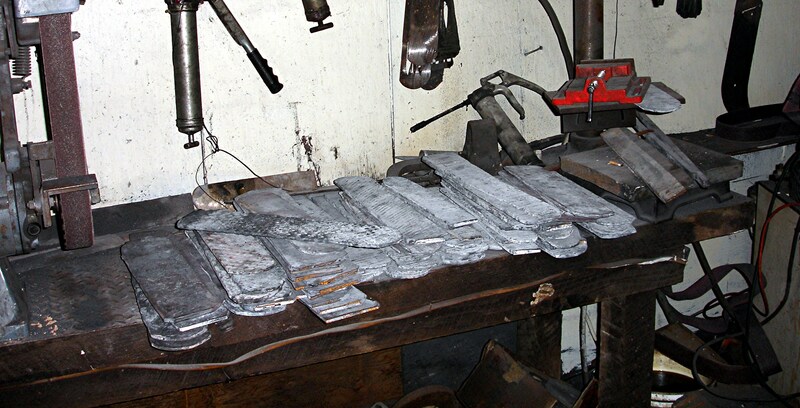 Next the steel was being hammered by thousands of pounds into the shape and size needed. 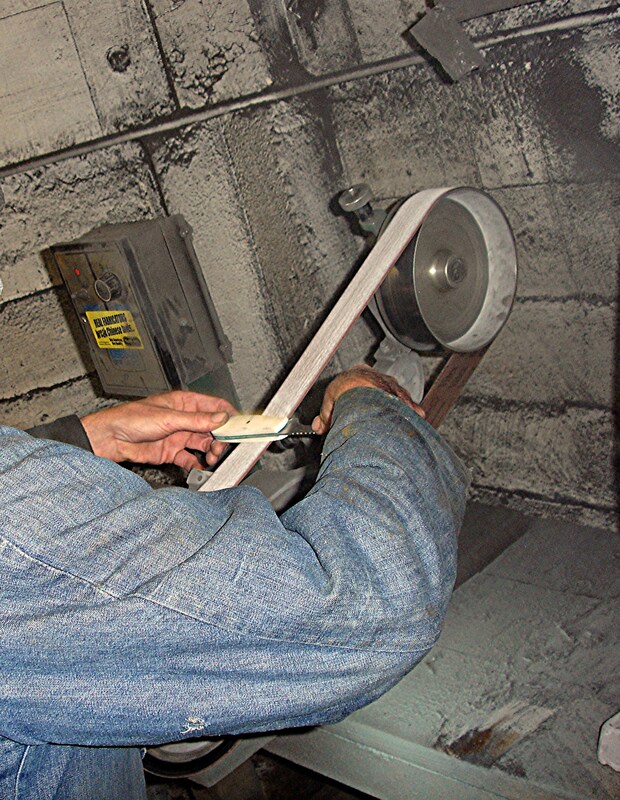 Hand grinding the knives into tactical shape.